Kebabs are a preferred barbecued food almost everywhere. 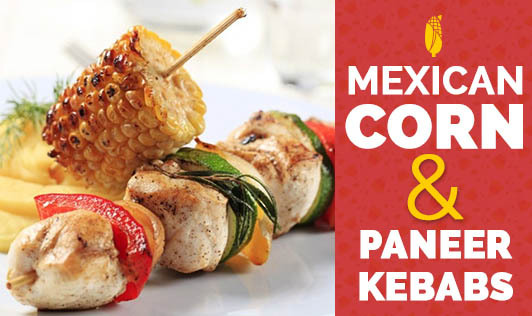 The Mexican spice mixture makes these kebabs delicious and tasty. • Wash and drain the baby corns and mushrooms, and simmer in hot water for 5 minutes. Remove them from water and keep aside. • Mix cocoa powder, chili powder, curd, garlic, oregano, and oil together in a bowl, season with salt and pepper to make a marinade. • Add the capsicum, baby corn, paneer, white onions, and mushrooms in the marinade. Mix well and allow it to stand for 4 to 5 hours. • When the guests arrive, heat the grill (sigri) and cook the kebabs in front of your guests. • Serve hot along with chutney and spring onions.